Is The "Frerichs Vortex" The Real Reason For The Recent Weather? Are you as confused about the weather as we are? Leave the house wearing a jumper. Walk home from work sweating our balls off. Next day, we need to put the jumper back on for our walk home. Nothing seems consistent. For most of us in Central Illinois, it was super hot on Monday and Tuesday followed by a few days of unseasonably cool - almost fall-like - weather might not just be a coincidence? Could it be? Could it really be? A sighting? Looks like some folks including Super Abe on Twitter have spotted the "Frerichs Vortex" and are blaming the recent weather on it? We have to admit, this isn't all that surprising. This week has been the epicenter of the "Frerichs Vortex". Aren't familiar with The Frerichs Vortex phenomenon? Check out this post that shows how Wikipedia thinks about it. 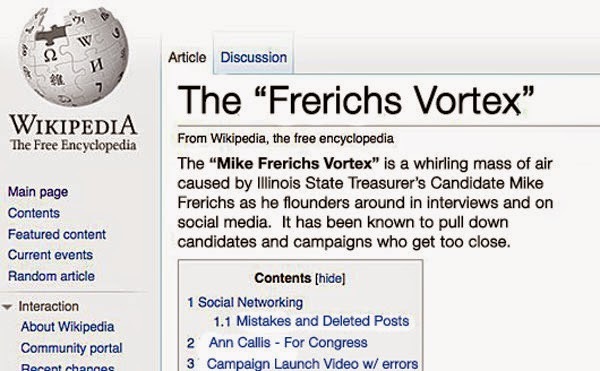 The "Mike Frerichs Vortex" is a whirling mass of air caused by Illinois State Treasurer's Candidate Mike Frerichs as he flounders around in interviews and on social media. It has been known to pull down candidates and campaigns who get too close.